[Recreator Required] Cannot save macros - Kantu - Forum for Kantu Task and Test Automation and the free OCR API. I apologize if this question is already answered somewhere. I can’t find any sticky posts or anything referencing this problem. I am brand new to Kantu and/or Selenium, so I’m still stumbling through it. I just installed Kantu on Firefox for the first time and am having trouble with two things. If I forget I have a macro recording and continue to surf the web, when I come back to the macro, I can stop the recording, but can’t see how to clear the entire macro instead of deleting it line by line. How can I clear the entire thing?? If there’s a better way or place to get my answers, please let me know. I would prefer to be able to find my own answers next time, if possible, so I’m not wasting anyone’s time. Can you add a screenshot of this error? Is this the latest Firefox version? And if you try Kantu for Chrome, do you get the same error? We have heard about such reports before, but so far are unable to recreate them on our test systems, that is why each bit of information can be useful. Is there anything special about your system or your Firefox? If you want to clear a large number of lines, the fastest way is to use the source tab. I haven’t tried Kantu in Chrome, so don’t know about that. More info: This error occurs after inputting the name of the macro and clicking the “Save” button, no matter what name I type. Clearly, something goes wrong in your installation. As a test: Does uninstalling and reinstalling Kantu solve the issue? Note: Make sure to backup your macros before uninstalling. I have uninstalled and reinstalled Kantu twice. The error is still there. I noticed that as soon as LastPass doesn’t work, Kantu doesn’t work either. All other addons are not affected. First this error occurred in Firefox version 62.0.2 and later. I also am affected by this error. This is interesting information. 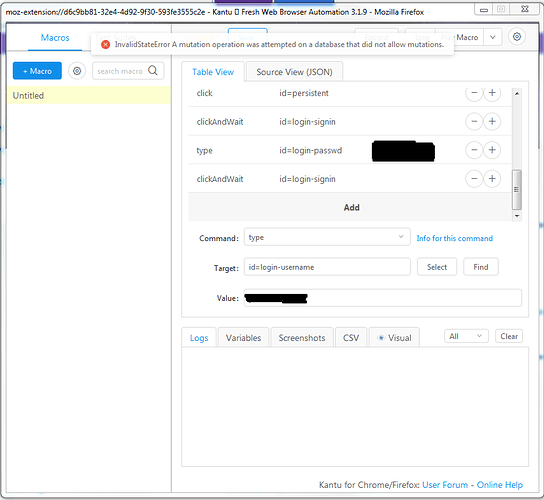 What Lastpass and Kantu have in common is that they both use HTML5 Local Storage to store data (in our case macros and settings). But we can not recreate the issue here (yet)… I just tested again and all works fine on my Firefox 62.0.3. I just updated my Firefox to 62.0.3, but still no luck saving macros. @Shadow …if you test Lastpass on Firefox, does this extension fail for you as well? I don’t know. I don’t use LastPass and don’t want to approve of the permissions it’s asking for. I have updated my graphics card drivers, so far all without any problems. I hope it stays that way, then we know where the bug came from. I had the same problem, it disappeared when I created a new profile for Firefox. And it reappeared when I changed my Firefox settings to “Never remember history”. And disappeared when I changed it back to “Always remember history”. Is there any update on this? I’ve tried uninstalling and reinstalling a couple of times, but it doesn’t seem to fix the problem. We still can not recreate this issue, but there is now a very good workaround: You can switch to file storage mode - please let me know if this solves the issue. Open firefox as user install kantu addon -> save fail, never demos present. I’ve a admin and a user account on my win7 system. I tested on Win 7 with a normal user account and all works fine. So we can still not recreate the issue here. And then reinstall Kantu. I have to do this every time I restart my computer. I do not have this problem in Chrome. Export the macros you create when using Firefox if this is happening to you. You can then just import them back in after you reinstall.